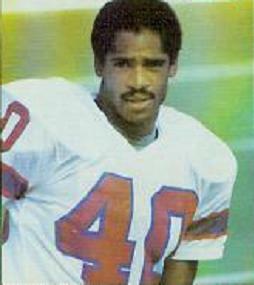 Highly regarded following a college career in which he was a two-time All-American and three-time All-Western Athletic Conference selection, Haynes was chosen by the Patriots in the first round (fifth overall) of the 1976 NFL draft. He quickly made an impact, both as a defensive back and a punt returner. Patriots went 11-3 to finish second in the AFC East and qualify for a Wild Card berth. Lost AFC Divisional playoff to Oakland Raiders (24-21). Haynes quickly developed into one of the NFL’s premier cornerbacks and was chosen to the Pro Bowl in each of his first five seasons. He intercepted 23 passes during that time and averaged 10.9 yards on 105 punt returns, most of which came during his first two years. Fast and with excellent reactions, as well as being a thorough student of his craft, he was outstanding at pass coverage. Following an injury-shortened 1981 season, he came back with one last Pro Bowl year for the Patriots before moving on to the Los Angeles Raiders. Haynes led the NFL with 220 yards on six interception returns in 1984, his first of two consecutive seasons in which he received consensus first-team All-Pro recognition. His career lasted 14 years, until 1989, and he ended up with a total of 46 interceptions and nine Pro Bowl selections. Haynes was inducted into the Pro Football Hall of Fame, Class of 1997.